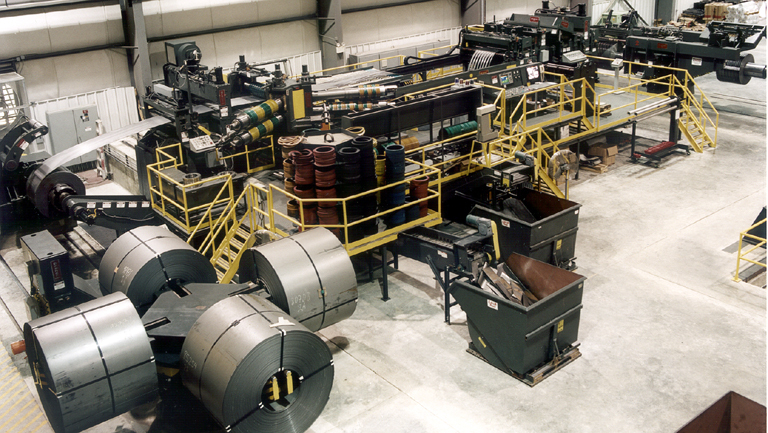 Huger, SC - January 2000 - Steel Technologies, Inc., has completed the installation and start-up of a high production coil slitting and packaging line at its new coil processing facility in Huger, South Carolina, near Nucor Steel. The slitting and packaging line was designed and manufactured by Braner/Loopco, Schiller Park, IL. Because of the high water table and swampy conditions in Huger, SC, a deep looping pit could not be installed without exorbitant cost. In lieu of a deep pit, a "Loop Doubler" was included in the line. The Loop Doubler is a device that forms two loops between the Turret Slitter and the Tensioner, effectively doubling the free loop storage capacity in the shallow pit. The new slitting line is capable of processing hot band, hot rolled pickled, and cold rolled high strength coils in gauges from .010" through 1/4". The line will handle 80,000# x 72" wide coils with coil diameters up to 84". 850 line horsepower is utilized to process lighter gauges in the "free loop" mode at 1,500 FPM. Heavier gauges are processed in either "push-pull" or "tight line" modes at 500 FPM. An Entry Turnstile stages 4 coils ahead of the slitting line. The Uncoiler is equipped with a DC motor drive for strip tension and threading. An Outboard Bearing supports the Uncoiler shaft to eliminate shaft deflection. A laser beam is utilized to position and align master coils on the Uncoiler. The Entry Unit houses the Telescoping Blade Peeler, Entry Pinch Rolls, Non-Contact Thickness Gauge, Automatic Edge Detector, Power Adjusted Side Guides, and Entry Guillotine Shear. The slitter is a three head quick-changeover precision "Turret Head" slitter equipped with two 72" x 10.5" heads, and one 60" x 10.5" head. The Turret Head slitter is equipped with motorized arbor and bearing housing position adjustments, electronic digital position readouts, and is powered by a 300 HP DC motor. Scrap edge trim disposal is accomplished by a Braner/Loopco Dual Rotary Arbor Scrap Chopper and Scrap Conveyor. The Chopper is powered by a 100 HP drive synchronized with the slitter speed. In addition to doubling the pit storage capacity, the Loop Doubler acts as a highly efficient slit strip threading device. The line is equipped with Braner/Loopco's "Cluster Leveler" to correct strip shape defects such as wavy edges and center buckle. The patented Cluster Leveler allows Steel Technologies to improve strip shape throughout the entire slitting line gauge range of .010" to .250". The Cluster Leveler utilizes work rolls from 1.500" through 3.000" diameters with seven flights of adjustable back-ups for shape correction. Leveler set-up is made operator friendly via the use of microprocessor controls. Slit coils are rewound on a Turret Recoiler. This Recoiler is equipped with two independent rewind mandrels and two independent Overarms, mounted on a 180 degree rotating base. Coils can be processed on one mandrel, while slit coils on the opposite mandrel are prepared (coil tail banding) for unloading. The mandrels are powered by a 300 HP drive when in the running position, and smaller independent drives when in the unloading position. A unique safety device, "tail hold-downs" are installed on both Overarm Separators to secure the outer wraps and prevent clock-springing of high strength coils. Slit coils are packaged on a Braner/Loopco Coil Packaging Line equipped with a fully automatic and "operatorless" Slit Coil Downender.